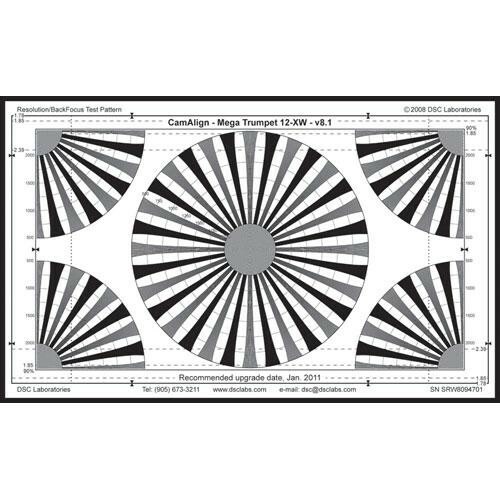 The MegaTrumpet 12 Maxi CamAlign Resolution & Focus Chart from DSC Labs is designed for calibrating resolution and focus with virtually any video camera throughout the world. Many video professionals consider calibration charts a necessity for optimizing camera performance and the production value of images. This chart has been designed with that philosophy in mind and works equally well in engineering or production work. Not only can you expect high resolution and exact focus when you align your camera correctly with the MegaTrumpet 12 Maxi, you can also gauge the level of chromatic aberration. Box Dimensions (LxWxH) 33.0 x 24.0 x 4.0"